Sony sold off its Vaio PC unit in February due to sluggish sales, but don't think that means Sony Vaio laptops aren't smoking hot. For the second time in 2014, a Sony PC model is at risk of overheating, smoking, catching on fire, and even melting. This time around, the smoldering Vaio in question is the Flip PC with model number SVF11N13CXS. After four units malfunctioned in Asia, Sony has decided to recall the device, according to a notice on the U.S. Consumer Product Safety Commission's website. The Vaio Flip laptop-tablet convertible came in silver, black, and pink, had an 11.6-inch touch display, and was sold in stores nationwide and online for around $800 between February and April. Consumers should immediately stop using the recalled personal computers, shut it down and unplug it; and contact Sony for instructions on how to arrange for an inspection free of charge to the consumer and a free repair or full refund of the computer’s purchase price. Owners of the Vaio Flip are encouraged to contact Sony at 866-702-7669 to receive a free inspection of the device, followed by a free repair or full refund. 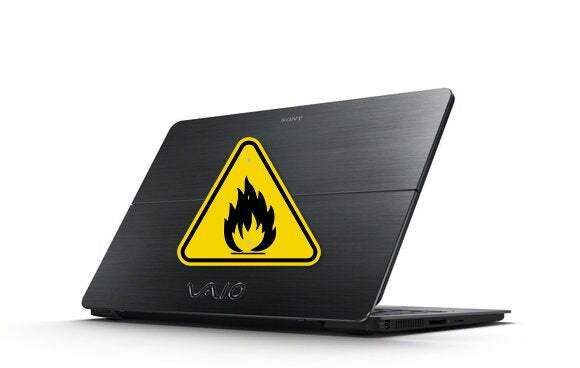 Sony's latest Flip out follows a similar warning in April, when Sony warned that the Sony Vaio Fit 11A was at risk of overheating. The Fit 11A's problem was a faulty battery. The CPSC notice did not say what the problem was with the Flip. Sony's recall comes just as the Vaio brand is being reborn under new management. The investment firm that purchased Sony's PC business in April recently relaunched the Vaio brand targeting solely the Japanese market. The new Vaio company has yet to design its own PCs, so far reintroducing two Sony-designed Vaio models from 2013: the Fit 15E and 11- and 13-inch Vaio Pro laptops. The new Vaio company is not connected to the models under Sony's latest recall.